In late January Meadowbrook Orchard Steward John S. gathered the Sunday volunteers of MCGO. The Orchard time together gave all the opportunity to talk through the progress and future opportunities for the volunteer community. Updates on the Edible Hedge (along NE 105th), East Orchard, Fig Orchard and Chestnut Grove were some of the highlights. The opportunity to widen the circle of volunteers was also discussed. 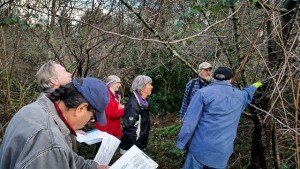 The Meadowbrook Community Garden and Orchard group(MCGO) is guided and directed by the lead gardener of Seattle Parks for the 7 acre Meadowbrook site. Path improvement, site maintenance and creating a ‘welcoming’ destination are some of the immediate goals of the group. Planning, implementation and visioning began back in 2011. Ongoing efforts are also supported by larger volunteer events held throughout the different seasons. Go MCGO!